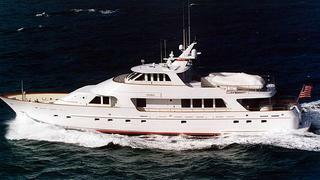 Gregg Child at Northrop & Johnson sends news of another price cut on Delta Marine’s 33.53m motor yacht Onika, this time by $250,000. Built by Delta in 1993 to a design by Stephen R. Seaton and refitted in 2004, she’s been well maintained throughout by her owner and crew. A Glade Johnson interior sleeps six guests in three cabins plus five crew berths while twin 1,450hp Caterpillar engines give Onika a crusing speed of 14 knots and a range of 1,880 nautical miles. Gregg comments that the owners are ready to sell as they're building another Delta. Onika is now down from $4.75 million to $4.5 million.